For cartilage tissue repairing, it remains a key challenge to design implant materials with antibacterial activity, proper degradation rate and mechanical property. In this research, antibacterial nanodiamonds (QND, QND-Ag) modified acrylate-terminated polyurethanes (APU) were prepared. By the addition of nanocomposites, the crystallinity of modified APU obviously increased, which indicates a strong interaction between NDs and APU. Tensile and compression tests were carried out to evaluate the improved mechanical properties. Compared with APU, APU(10%PEG)/QND-Ag possessed the increased modulus and strength, a nevertheless slight decrease in elongation at break. 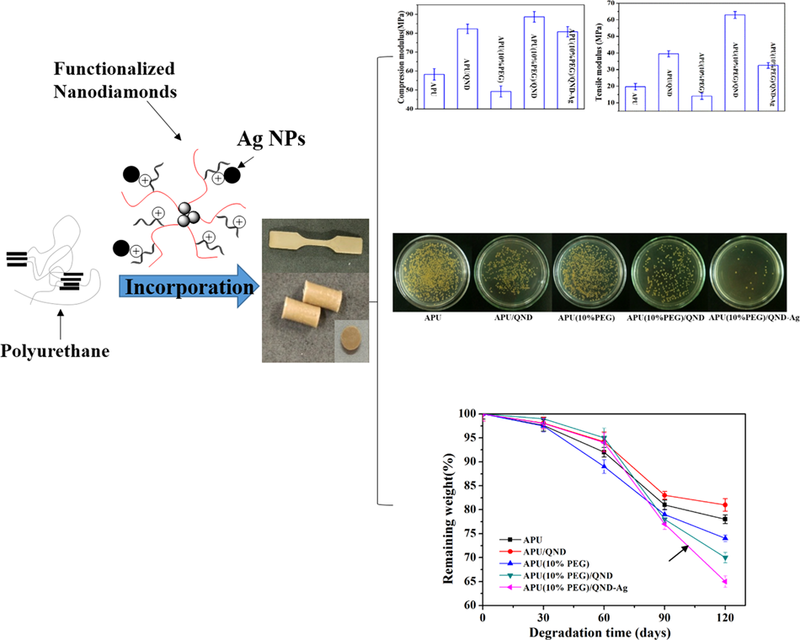 Due to the dual actions of contact-killing of cationic polymers and release-killing of the Ag NPs, QND-Ag-containing polyurethane showed excellent antibacterial activity against Staphylococcus aureus. Moreover, APU containing polyethylene glycol showed a significant increase in degradability rates. 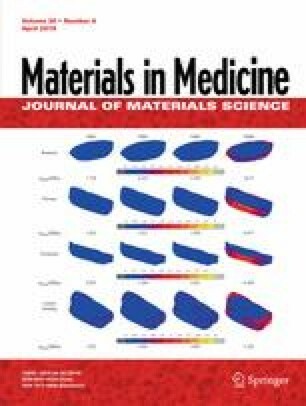 Consequently, owing to the dual effect of crystallinity and hydrophilicity, our modified APU exhibited the proper degradation rate adaptable to the healing rate of cartilage tissue. Furthermore, the CCK-8 results demonstrated that synthesized samples were low toxic. Therefore, APU(10%PEG)/QND-Ag holds great promise for the application of cartilage tissue repairing. The online version of this article ( https://doi.org/10.1007/s10856-019-6244-8) contains supplementary material, which is available to authorized users. This study was supported by state funding Natural Science Foundation of China (No. 81460107 and No. 51508233).